With Fiona’s experience and qualifications plus the support of the Rosemary Franchise, she feels confident her business will flourish. ‘’I have always wanted to run my own business and I am really looking forward to being my own boss, facing the challenges ahead and providing a fantastic Rosemary bookkeeping service to businesses. Rosemary Bookkeeping opens in Bridgnorth and Wolverhampton! Local businessman, Mark Hamblett has launched his new Rosemary Bookkeeping business in the Wolverhampton and Bridgnorth area. Launched in 2002, Rosemary Bookkeeping franchisees provide tailored bookkeeping for small businesses and accountants across the UK. Many Rosemary clients are owner-managed, typically with fewer than 10 employees, across all industry types. They are generally too small to justify employing their own bookkeeper but generate too many financial transactions to manage themselves. As all businesses in the UK are required to keep records of their financial transactions, Rosemary Bookkeeping franchisees respond to this increasing need for an affordable, professional bookkeeping service that supports both the client and the accountant. Rosemary Bookkeeping was acquired by national franchisor ServiceMaster in 2017. 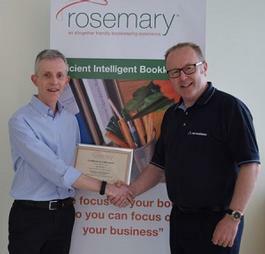 With almost 60 years’ experience in franchising, and a portfolio of some of the UK's leading franchise brands, ServiceMaster, TruGreen, Merry Maids and Furniture Medic, you can be sure that you are backed by the best when you buy a Rosemary Bookkeeping franchise. Rosemary Bookkeeping is a truly scalable business; you can work from home choosing hours to fit around your lifestyle/family commitments, or you can build the business into a management style opportunity and manage your own team of bookkeepers. The truly flexible nature of this franchise allows all franchisees to run their business from a dedicated office within their home. This enables not only flexibility but keeps your operating costs low as there is no need to pay extra costs to hire an office. We show you how to set up a fully functionally home office incorporating all your telecommunications and IT requirements to run an efficient business and how to best communicate with clients; generally you would meet them at their business premises or a mutually convenient location. Whilst hours are flexible, it doesn’t have to be a 9-5 job but you must have a full time attitude – work the hours that suit your needs and enable you to meet your financial targets. Our franchise model enables people who want to run a business which provides flexibility but enables strong growth by developing a team of bookkeepers (your bookkeepers will need to be either experienced or qualified). All our franchisees utilise our knowledge banks and technical team at head office who have over 60 years experience. How much does Rosemary Bookkeeping cost? The minimum personal investment for this franchise opportunity is £5,511 + VAT which is 30% of the total franchise fee. Up to 70% of the total franchise fee can be financed through most major banks and franchise finance providers subject to status. For our full franchise cost, fees, recommended start-up costs and conditions, please request further information through the form below. Your training will commence with a ‘getting to market’ training course. Our successful franchisees have a broad spectrum of backgrounds, from IT and recruitment executives, ex-military to bookkeepers and accountants. We are looking for energetic, business-minded people who are driven to build a professional bookkeeping firm and make it a success. Whilst an understanding of numbers is important, as is being IT literate, more so you will need demonstrable people skills and be able to delegate with a positive ambitious attitude. Sales experience is an advantage in any business, but it is not essential as we will provide sales and marketing training. Remember we will work with you to maximise your strengths and our tailored training will ensure we give you the additional skills you need for your Rosemary Bookkeeping franchise. By filling in the form below you will be able to receive a copy of the Rosemary Bookkeeping prospectus.